Why UI so slow & glitchy on 5k Retina? Why UI so slow & glitchy on 5k Retina? Zooming its pain, more than 1 track in arrange it pain, full screen mode painful too. How we can use new tools, devices, if we can't work with GUI? Over two years I send it to support/bug report and nothing! [UPDATE] Have solved this issue with Resolutionator https://manytricks.com/resolutionator/ Need to set NON-RETINA (hidpi) resolution and all works fine! It should but is it. I have iMac Late 2015 5K and its have no drop down powerful like a new MacBooks. All system works in normal mode and temperature, in my room 25 degrees in celsius. I have installed last versions of Logic Pro X and Ableton Live 10 and it works smoother and faster than Bitwig in same mode. I do not change any display settings, all using in default mode. In 'Intel Power Gadget' system temperature is 55-60 C.
Can you send us a screenshot while the UI is slow and glitchy with the Intel Power Gadget open in front of it? Also a screenshot of your display preferences of OSX would be interesting. At last I bought thunderbolt->hdmi cable and connect my 1080p second display (DELL) and guess what... right! On the second 1080p display Bitwig works brilliant! But if I drag Bitwig back to my iMac display all works terrible again. I recently bought a new display (HP Envy 27s) as the second display for my iMac 27 5K. On both displays the same screen resolution is 2560x1440. And on the iMac I have glitchy and freeze UI when zooming but on the HP Envy 27s everything is great and smooth. I have the same problem! Imac 27 5k! exactly the same! Logic works fine, but bitwig slows down! it's awfully shaking! I also have issues with lagging graphics. I use an external 4k display through HDMI on my mid 2014 15" MBP. The CPU meter can be well under 20% when this occurs. I would love to know why this happens. It can be incredibly frustrating when your meters are a 1/2 second too slow. Likewise, these issues are not present in any other DAW I use. 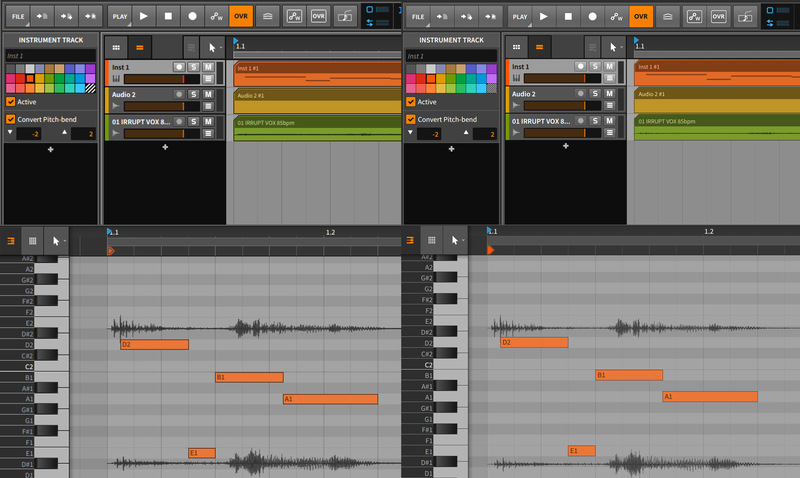 A real shame as I am very much hooked on Bitwig at the moment. Add “Low Resolution” support for macOS users PLEASE!!!!!!!!!!!!!!!!!!!!! We can’t enable this in Bitwig.app “Get Info”. Yeah! I will try it but unfortunately it not works for me. Bitwig still launching in the hi res ignored all editing in your instruction. Try it on 2.3 and 2.4 versions and have no changes. Sorry to hear that. They're not mine instructions, I don't even have any Apple products so can't help. Maybe try mailing the guy who posted it? Apparently it works for him & other people that followed his advice. Already sent that to guys on kvr about my issue with this methods. 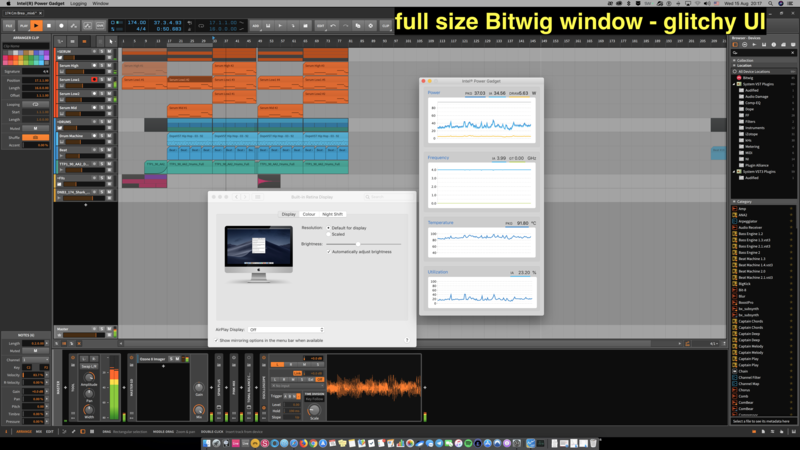 I using Bitwig only on my second 27" external dysplay now, work as brilliant. But on iMac it’s terrible! For testing my second display I connect it via Display port instead HDMI and I have the same laggy/freezing GUI zooming as on the iMac now! Guys you must give us setting to open your DAW in low resolution on Mac! Ok! Some results of my new tests here. • External display 27" 4K via HDMI (low res quality DPI picture) Works well on all resolutions. 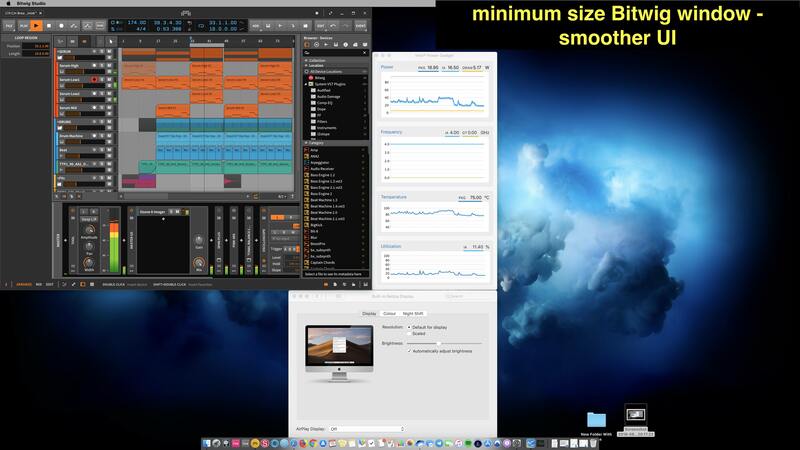 • External display 27" 4K via Display Port (high res quality DPI picture) Works well only on 1920x1080 and 3840x2160 resolutions. Come on guys! Do something with it, please! Low Resolution enable maybe? Have solved this issue with Resolutionator https://manytricks.com/resolutionator/ Need to set NON-RETINA (hidpi) resolution and all works fine! when will they fix the GUI problem on Mac 5K Retina? This is absolutely a mockery of users! What about HiDPI Retina support? Do you like the GUI? Graphical representation of device nesting - v1 vs. v2? Where has the Automation Follow button gone?